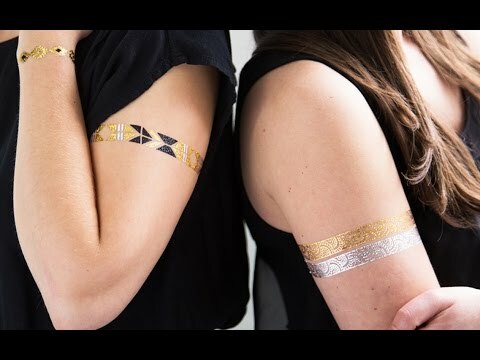 ELLEtatts are temporary tattoos that let you accessorize in a flash. 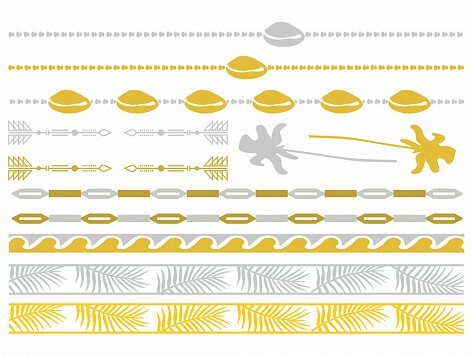 Created by jewelry designer Neda K., the shimmery gold, silver, and black designs can be worn as necklaces, arm bands, and cuffs. Sheet dimensions: 5.5" x 8"
Gave as a Christmas Present to my 17 year old niece and sister-in-law. They seemed excited to give it a try! Accessorize in an instant with ELLEtatts—temporary tattoo jewelry that glistens like the real thing. Affordable and elegant, ELLEtatts shine in necklaces, armbands, and cuffs of shimmery gold, silver, and black. These tattoos are the work of acclaimed jewelry designer Neda K., whose RouELLE line has been worn on many a red carpet. She now brings her artsy aesthetic to a trend that can adorn anyone. Wear ELLEtatts separately or layer them with traditional jewelry for a more complex composition. They look lovely and they’re practical, too. There’s no fear of them catching on fine knits, and, on a trip, they’re easier and lighter to bring along than valuables. Neda K.’s philosophy is to help women express their personal style and creativity. At the beach, a night on the town, or a black tie event, ELLEtatts are a quick way to complement—or reinvent—your look.